Dave Challinor is surprised by the lack of interest in his players this transfer window – though the AFC Fylde boss is not complaining. 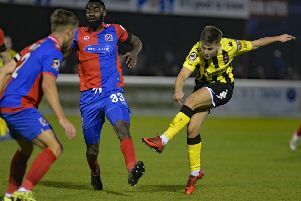 Fylde were bracing themselves for interest in top scorer Danny Rowe who caught the eye in the National League side’s FA Cup games with League One leaders Wigan. Rowe netted in both the 1-1 draw at Mill Farm and in the second round last-gasp 3-2 defeat at the DW Stadium. A number of Challinor’s other players like midfielder, Sam Finley, also impressed in the ties but the club has not received any official bids. “There has been no interest whatsoever,” Challinor said ahead of Saturday’s home clash with Guiseley. “I’m normally the first person to get told anything and we have not had anything for any players. “Is that good news? It is good news for me I suppose but is it a bit surprising? Yeah. “Ultimately you’d expect that if players had done well there would be teams interested. “I think this window is, I suppose, a bit of a dangerous window for clubs and I suppose most look to do most of their business in the summer. “Certainly what we have so far there has been no interest in any players. For his part, Challinor has brought in loan pair Callum Chettle and Sam Stubbs. The Coasters are actively looking to recruit but seek quality rather than quantity. Challinor said: “We are still actively looking. “It is whether good ones that can better us become available and if they do we would be daft not to. “With us not specifically having a transfer window, our recruitment is pretty much throughout the course of the season. “We have had trialists in to have a look at. “If players become available and come in and do well it would be daft not to look at them. Finley returned from suspension for the 1-1 draw with Chester in midweek. And Challinor says he needs everyone this month if his 11th-placed side wish to battle it out at the right end of the table with Henry Jones and James Hardy set to return from injury soon.